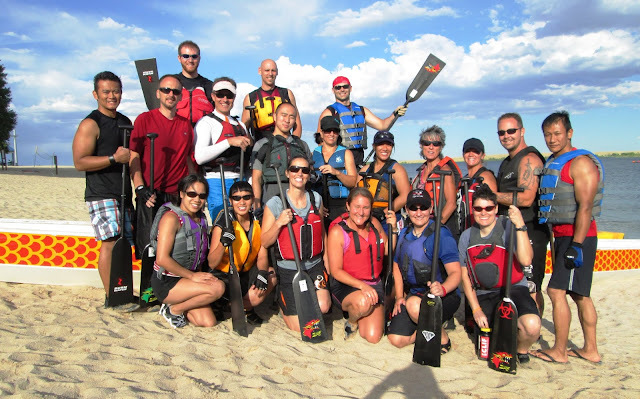 I am looking forward to traveling to Denver in late July to race with Coby and the Flying Dragons at the Colorado Dragon Boat Festival (http://www.cdbf.org). The pictures below were provided by Coby (under raised paddle, 4th from back right). I'll also be there to spend time with Rosalind and Michelle (Raytheon Rowing Racers) and the Kalyn (Unstoppable). There will be standard Hong Kong style boat races and Taiwan-style boat "flag catcher" (see picture below) races to participate in. 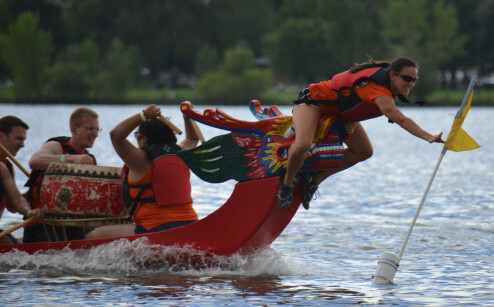 Picture from the Colorado Dragon Boat Festival. They have two Taiwan-style dragon boats they use for Flag Catcher races. For those of us used to Hong-Kong style boats (BuK, Champion, SRS, Kahlua, Lively-Dragon, etc), these boats look like tanks! But what a great new experience, which is what it is all about. The clock stops when the flag is pulled at the end of the race. If anyone else is interested in going or wants more information, please don't hesitate to let me know. I am wishing all my friends from Denver and area all the best as they practice and prepare for the festival. We were all together at the Pines Camp in Florida in April.